After years of accepting his natural hair loss this 66- year- old man decided it was time to change things up. He had watched the gradual, yet steady, loss of hair in the front and top of his head. Slowly his hairline had faded, and faded, until it finally disappeared. The top just behind the hairline went the same way as he started combing ever more hair over from the side to at least ATTEMPT to cover some of the baldness. And just as he was just beginning to accept his new look, he realized the bald spot in the back had gone from a mild faded “hole” to a full- blown opening. This is classic male-patterned baldness, and there was really nothing he could have done about it. This was his genetic fate, but it did not have to be his cosmetic reality. He started to do his research for the best hair transplant doctor and found Dr. Sam Lam of Plano, Texas, with whom he scheduled a consultation. It didn’t take long for Dr. Lam to see the challenges. This gentleman had ample donor area, so that was a good thing, but the caliber of each of his hair was relatively thin. Dr. Lam knows that it’s better to have one thick hair than two thin hairs but, again, genetics would have its way and Dr. Lam would have to figure his away around the problem. Then there was an added issue, this patient had a huge area of hair loss. Almost the entire front, top, and crown of the head. And, of course, the crown loss was mostly on the vertical axis making it the most obvious and difficult to cover. Not to be dissuaded and always up for the challenge, Dr. Lam decided to remove thousands of grafts using FUT (strip) technique. 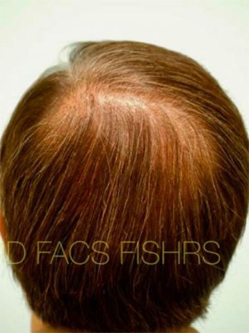 He and his team carefully divided the strip down to follicular units and using a very well thought-out strategy distributed these grafts in a way to maximize the final cosmetic appearance. This means Dr. Lam had to envision what each hair would look like when grown and how it could work together with the other transplanted hairs to offer maximal coverage. You must be highly skilled and experienced to pull this off. And while Dr. Lam does this with seeming ease, it’s really not that easy. What is remarkable about this result is the way Dr. Lam smartly avoided recreating the “whorl” pattern one usually associates with crown procedures. Instead he opted for a “drape” pattern without which this patient would not be enjoying the astounding coverage he now does. Also note the top of the head. Dr. Lam dispensed with the need for a comb over. Look at the where the “part” on the top of the head is in the before photo. It’s way over to the patient’s left side. Now look where it is in the after photo. It’s where it belongs closer to the top of the head. This is as it should be. And let’s not forget the front. 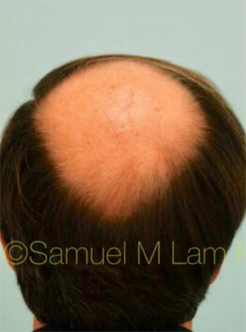 Dr. Lam MASTERFULLY rebuilt the hairline so that it had a natural, yet full, appearance. Could he have lowered the hairline? Yes and No. If he lowered it, then he would have fewer grafts to cover that vertical crown bald spot, so instead he opted for a higher hairline that would allow him the best of both worlds. The results speak for themselves. 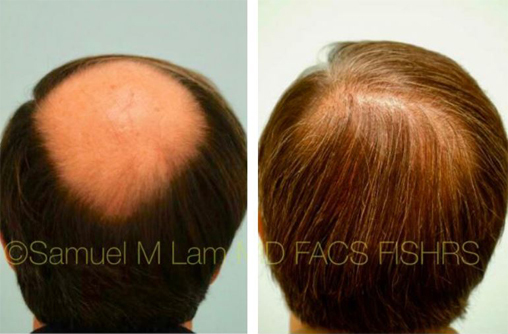 This man was fortunate to have found a hair restoration surgeon like Dr. Lam who was flexible and creative enough to tailor a hair transplant to his specific needs.